Witness the unveiling of a brand new AquaSonic listening machine, interpreting the voices of water in a previously unseen Audio Visual Puppet Spectacle! 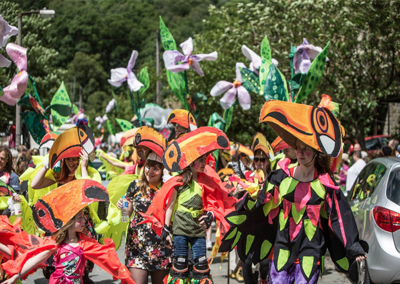 A stunning piece of participatory puppet art from the Valley’s leading parade company Handmade Parade will celebrate, explore and commemorate the many narratives water has in the town of Todmorden. Local artists will work with young people and adult volunteers and the performance will take place at Todmorden’s Harvest Festival on Sunday 17 September. Grow With The Flow is one of six creative waterworks projects which will feature in the BIG WEEKEND at The Piece Hall on Saturday 30 September and Sunday 1 October. Performances will take place on Pollination Street in Todmorden at 12.30pm, 2pm and 3.30pm. Wear wellies. It might be wet.